Chili is a great way to make your food taste great. It is informal, can serve a gang, and can be prepared well ahead of time. If you love chili, but want to know what to serve with chili to make things even spicier and delectable, you've come to the right place. Here, you will find a number of impressive chili buffet menu created for easy entertaining. You simply need to rustle up a stew pot of chili and have it with simple yet delicious accompaniments. You can definitely add anything you want to your table, but here's the list of what goes good with chili. There is a variety to choose from, but blue corn chips will work great with chili. Serving it with the spicy stew will also give you several good eating options. It is possible to eat the chips after pouring the chili on them, or you can simply dip the chips in the bowl. You may consider eating them separately to have a salty change of taste. In some areas, you will see chili being served on top of spaghetti, just like a pasta sauce. It is also a good idea to use rice as the very first layer in the bowl. You can then smother it with the soup. To give chili a better texture and taste, you may consider opting for cooked elbow macaroni. You can leave the macaroni in the chili in the refrigerator at night and let it absorb all the spices until the next morning. It may also be a great idea to add canned or frozen corn kernels to make your dish look colorful. If you're not that sure about what goes with chili, try simple toppings and condiments. You just cannot go wrong when you serve a bowl of chili with toppings. Many restaurants offer this condiment selection as part of their menu and call it a chili bar. The most common dairy toppings include parmesan or jack cheese, shredded cheddar, crème fraiche, or sour cream. You can also use vegetable condiments such as chopped or sliced canned or fresh jalapeno peppers, white or green onions, roasted red peppers, diced canned green chilies, green bell peppers, sliced radishes, chopped fresh tomatoes, and fresh mushrooms. 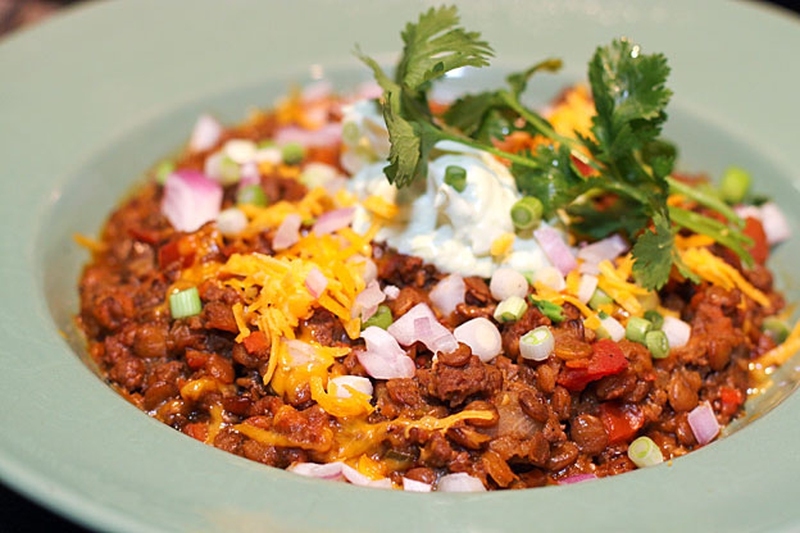 You may even see some people go with refried beans and bacon bits as chili toppings. When you want to know what to serve with chili to create a perfect pair, you may consider opting for applesauce. It's the safest choice really. You can add some green peppers to give your bowl of chili some extra zest. Serve it with red wine and it will feel even better. You can also mix it with other foods such as potatoes stuffed with garlic. Roasted potatoes will also compliment your bowl of chili, and you may also consider mixing it up with cheese. The best thing about salads is that you can actually find endless variations. The easiest way to make everything look perfect is to sprinkle some chili on green salads for amazing taste. Adding sweet corn to green salads will improve flavors. You can also mix in some cilantro, diced cheese, source cream and onions for added flavor and texture. It will also help lessen the taste if the chili is too strong for your liking. A bowl of chili is quite like soup and tastes perfect when coupled with the right kind of bread. For Chili in Texas and the Southwest, there is no better option than cornbread because it doesn't require any rising time. It takes little time to prepare a loaf from scratch; alternatively, you can rush to the market to buy a boxed mix of fresh bread. While it is true that a warm loaf of homemade bread will compliment chili in a perfect way, you can definitely go to your local bakery and pick up fresh bread. By the way, biscuits will also go well with chili, and you can make them even impressive by adding chopped ham, shredded cheddar cheese, or sliced jalapeno peppers to your menu. Are you confused about what to serve with chili? Try desserts! You can always make your dinner look perfect by serving a dessert like brownies. A purely American dish such as peach cobbler or apple pie with ice cream will work perfectly. You can also consider adding a dessert with a Southwestern flair to make your chili dinner even impressive. You can opt for flan, sweet corn pudding, or dessert empanadas. The simplest of ideas is to add some sliced fruits in a bowl with a dash of cinnamon to add a healthy yet delicious finale to your meal. Chili will always go great with richly flavored beverages. You can always serve it with frosty mugs of ice-cold beer. It is also a good idea to serve it with fruity wine punches such as sangria or you can try red wines. You can add the lime and tequila in margaritas to compliment the bold tastes of chili. For children, you can prepare a lemony iced tea or sweet carbonated beverage to serve with chili. Server responsed at: 04/25/2019 8:16 a.m.